Although I haven't personally worked with the Discovery Channel 7KJ coilgun, here is what I know or have heard about its design. The goal was to use the capacitors in a series-parallel fashion. This would provide up to 2KV (iirc) at discharge time, but unfortunately they did not have a 2KV power source for charging. So they used a 500v charger and connected it via relays to one bank at a time. In addition, I heard they used a two-stage charging system. It began charging from zero volts using a current-limiting device, and after the voltage rose high enough it removed the current limiter. This solved the problem of overloading the power source from the initial in-rush current. 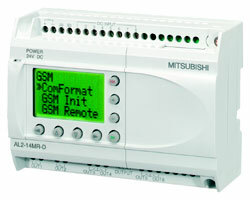 The charger is connected in turn to each of the four capacitor banks with a Mitsubishi Alpha 2 Programmable Controller (AL2-24MR). Read the datasheet overview.